Beautiful rhinestone and enamel Vermont pin. This 1960's State of Vermont pin belonged to a long retired Vermont State Employee. 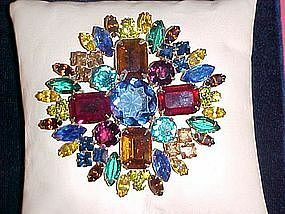 This pin is 1 7/16" in diameter and is framed in a blue rhinestone trim followed by a circle of white rhinestones. 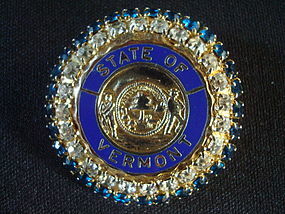 The wording State of Vermont is embedded in blue enamel with a center of the pin featuring the Vermont State Seal. It is in very fine condition!!! It would be a great gift for that special Vermont Lady!!! 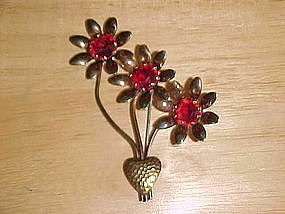 Wonderful vintage floral brooch with rhinestone flowers set in a hammered metal vase. 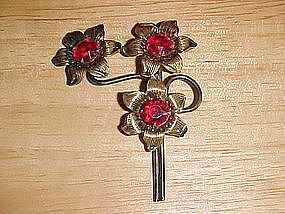 This circa 1940's - 50's pin has three lovely flowers, each with a large ruby red rhinestone center being held by a heart shaped hammered metal vase. This pin is in fine condition and maintains its original patina!! This pin is 3 7/16" high and about 3" wide. 1960's vintage silver toned rhinestone pin. 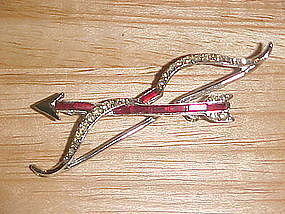 This pin is in the form of a bow and arrow symbolizing love. This would be a great pin for Valentine's Day. The bow has white diamond rhinestones and the arrow has elongated ruby rhinestones. This pin is 2 7/8" high and 7/8" wide and is in very good condition! 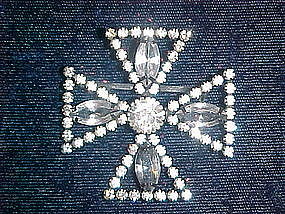 Fabulous sparkling maltese cross brooch with set faux diamond rhinestones. Circa 1950's. It measures 2" x 2" and it is in very fine condition. Would look great on a blouse, outer coat or hat. 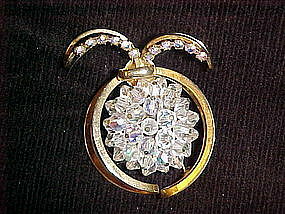 Lovely glass floral pin from 1960's. 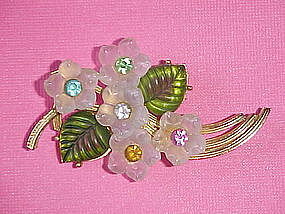 This pin has a gold tone metal base with attached molded glass flowers and leaves. The leaves have a iridescence glow. 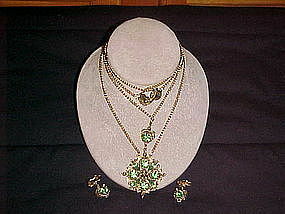 Each of the five glass flowers is set with different color rhinestone. 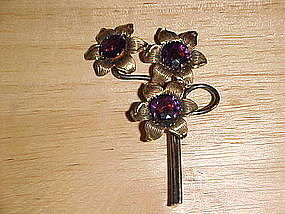 This pin measures 2 1/4" long and it is in Excellent condition.